The cleverly envisaged ‘Qut’ of a kalm which becomes ‘Quat’ foreshadows the surprise that awaits the viewer upon entering the Ejaz Gallery, Lahore and witnessing the wide array of paintings done by the artists in various techniques and mediums. The emphasis on medium rather than the typical beautified calligraphic text is what defines this exhibition. This group show is by 19 artists of Pakistan who are not traditional practitioners of Calligraphy; namely AQ Arif, Abdul Jabbar Gul, Bashir Ahmed, Chitra Pritam, Irfan Gul Dahri, Jamil Baloch, Noreen Akhtar, Mariam Hanif, Mashkoor Raza, Mudassar Manzoor, Mughjees Riaz, RM Naeem, Shahnawz Zaidi, Saeed Akhtar, Sadia Farooq, Ufaq Ehsan and Zulfiqar Ali Zulfi. With the commencement of the Holy month of Ramadan, It is no surprise that an exhibition showcasing calligraphic works commemorated Art and Islam; since the inauguration of the exhibition was followed by a lecture on “Art and Islam”. The distinctive feature of this exhibition is the evolution of calligraphy from the age of patronage by the courts, to the contemporary era where it now stands independently as an artistic expression rather than the painstakingly beautified illustrations meant for the transmission of Arabic text for the glorification of God. ‘Islamic’ does not necessarily imply religious in content or use: much of it is secular in nature. Instead, it is ‘Islamic’ because its artistic vocabulary is partly rooted in Muslim philosophical thought. The artists have blended the local, indigenous and foreign (Arab) technique of calligraphy with refreshing renditions. Upon entering, R.M Naeem’s painting holds the viewers attention by it’s depiction of the tragic events of Karbala. The usage of illustrative imagery with the separating walls etched with repetitive words holding up the walls is powerful indeed. His colour palette disturbs by the blood red but is instantaneously soothed by the blue of the foreground. 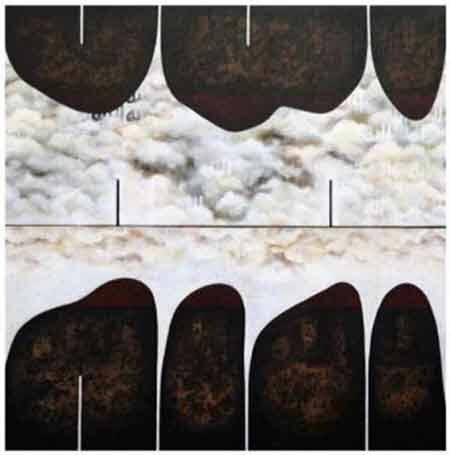 Opposite this is Mudassar Manzoor’s abstractions set against a white foreground, he uses the miniature technique to create a gaping hole sort of imagery that almost resembles a wound, probably hinting at the tear in the fabric of the Islamic world. Moreover vein like lines are creeping outwards almost appearing to be blurred out calligraphic text. Saeed Akhtar paints a traditional miniature painting while Jamil Baloch lures the viewer into discerning his noisy black and white paintings. Irfan Gul Dahri creates a canvas with mixed media that almost looks similar to a surrealist work. The works must be divided into two core groups; ones with very illegible or obscure usage of calligraphy and ones with core legible calligraphy. Abdul Jabbar Gull, A.Q Arif, Irfan Gull, Jamil Baloch, Mudassar Manzoor, Zulfiqar Ali Zulfi and Ufaq Ehsan have played with the constructs of abstraction or obscurity. This in no way entails the abstract nature of their work but rather the role calligraphy plays. Some have deliberately attempted to empty any representational content and suggested at the sense of suppression of the written word or rather it was a secondary consideration as the design aesthetics were more important to them. Some have used vivid imagery but kept the written text suggestive and indiscernible. The other group contains core calligraphy by Arif Khan, Ali Azmat, Bashir Ahmed, Chitra Pritam, Mariam Hanif, Sadia Farooq, Mashkoor Raza, Noreen Akhtar, Shahnawaz Zaidi, R.M.Naeem, Mugheez Riaz and Saeed Akhtar. Apart from R.M Naeem, Saeed Akhtar and Mugheez Riaz. Most of them used text and experimentation with the medium, while the latter three used vivid imagery to narrate a story. The show presents the custom of showcasing calligraphy in a holy month, thus fulfilling its task of commemorating the month of Ramadan.